Valeant is not the first company to be faced with the ruins arising from an aggressive, acquisition-driven growth strategy. Over the past decades, there have been plenty of examples that should have acted as a warning: ranging from ITT, Tyco, Wordcom and Enron in the USA to Parmalat, E.ON or Vivendi in Europe. But their rises and falls were rarely as rapid as Valeant’s. And the warning signs were rarely as obvious. 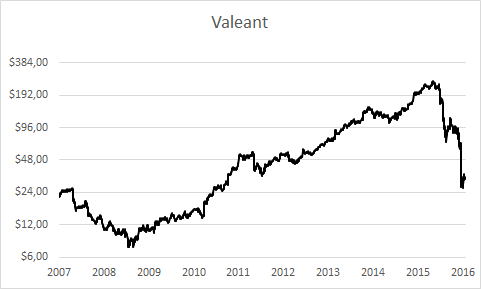 Valeant’s price increases – in some cases drastic – following successful takeovers had been disputed for a long period of time. The major US pharmaceutical companies, for example, increased their 2015 list prices for drugs (excluding new approvals) by 8% whereas Valeant, believe it or not, increased their prices by 66%. A company interested in building lasting constructive relationships with its customers would not do anything of the kind. Charlie Munger – who is chairman of a hospital in Los Angeles on a voluntary basis and, therefore, sees Valeant also from the point of view of clients – had been criticising their price policy as “deeply immoral” for a long time. He has to “hold his nose” when he thinks of Valeant. In addition, he had pointed out parallels between its business model and that of failed conglomerate ITT, describing it as unsustainable in the long run. Financial analysts in particular should have noticed a dramatic gap between the official GAAP profits, calculated according to globally accepted accounting rules, and those reported by Valeant, which had been adjusted for alleged special factors. Before the wave of acquisitions, the figures were more or less the same. Since then, the “adjusted” profits have increased substantially every year whereas, according to the GAAP figures, the company has alternated between years of profit and loss. 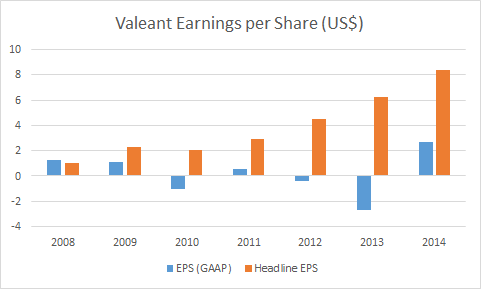 Based on GAAP, on balance, Valeant earned practically nothing between 2009 and 2014. Its share price, however, increased by 30 due to its alleged growth. But, even at the beginning of March 2016, with the collapse of Valeant looming, only 2 out of 23 analysts following the company issued warnings on the shares. In particular experts from the major Wall Street brokers were strikingly reticent about making negative comments. Now whether this might be because Valeant, according to the Financial Times, has paid some US$ 400 million in consultancy fees to investment banks over the past three years is anybody’s guess. In his recent annual letter to Berkshire Hathaway shareholders, Warren Buffett clearly explained that he considers the uncritical propagation of questionable company figures by analysts to be irresponsible, regardless of what the motivation might be. But not only analysts should be reproaching themselves for being blind and deaf with regard to Valeant. It is much more striking that so-called activist investors were also actively involved in the shady dealings. Strictly speaking, they are publicly committed to improving corporate governance and to replacing poorly managed measures with ones that boost efficiency. In this case, however, they were instrumental in orienting the company entirely towards reaping short-range profits rather than towards generating long-term value – regardless of the consequences. At Valeant, in particular Bill Ackman with his Pershing Square hedge fund and Jeffrey Ubben from ValueAct were not only involved in making dubious management decisions, but also actively supported them. As part of the Supervisory Board, ValueAct influenced important decisions, e.g. linking of management remuneration to the development of share prices, the aggressive price hikes, dubious accounting methods and slashing of the R&D budget. CEO J. Michael Pearson, who has been ousted since then, was appointed at the initiative of ValueAct. When the CEO of Allergan, David Pyott, resisted the takeover by Valeant two years ago, he was fiercely criticised by Bill Ackman. In November 2015, Bill Ackman still tried to convince other investors about the equity story of Valeant in a four-hour presentation. In retrospect, the management compensation system seems to be an act of extreme madness. It links the performance-based remuneration of top management almost entirely to share price development. The company’s operational success, however, played practically no role for the calculation of bonuses. This kind of compensation system is an invitation to management to get rich by producing reports of short-term success. Admitting to errors, on the other hand, is punished. If the value of shares rose by at least 15% per annum over a three-year period, management was generously awarded with options as a bonus: the better the share performance, the more options they got. The basic salary, however, played a minor role. CEO Pearson, for example, received a basic salary of US$ 1 million in 2014. A year later, in 2015, he chose to forgo his salary in order to increase his bonus payments. Indeed, by mid-2015, he had received so many shares and options from performance bonuses, that their total value was estimated to be US$ 3 billion at the time. A lesson from the financial crisis and the Internet bubble of the turn of the century is that incentive programmes encourage people to take hidden risks if they are linked to factors such as sales, share prices, etc. They are relatively short-term oriented, dependent on arbitrary factors and manipulable. In retrospect, it seems incredible that Valeant’s shareholder representatives still supported such a remuneration programme. Valeant’s business model even worked at the beginning of 2009 when takeovers were still cheap, some research budgets too lavish and price increases not excessive. Many of today’s large companies were formed by buying smaller competitors or weak companies in other markets, e.g. Axa or Banco Santander. But all companies that successfully grew due to acquisitions stopped buying other companies at some point and turned their attention to integration and to improving operational efficiency. Otherwise, the coordination of the acquired companies would have become too complex. The Valeant management, however, thought that it could continue for ever. Or they talked themselves into believing that it could because of course their generous bonuses were dependent on their ability to continue issuing reports of success with their new acquisitions. But the number of cheap companies that can be acquired is finite. In addition, a pharmaceutical company that engages in research cannot continue slashing R&D investments and there is a limit to how many price increases a company can make. To continue reporting growth, which was in everyone’s interests, they glossed over the weaknesses of further acquisitions with creative accounting methods. This worked because, alongside the megalomaniac company management, the shareholders and analysts also consistently deluded themselves. Sixteen years after the Internet bubble burst and eight years after the global financial crisis, the Valeant case shows that the financial markets have apparently hardly learnt anything from previous disasters; moreover, their ignorance seems even worse. Based on current information, Valeant did not cook its books on a large scale or provide phony figures at investor presentations or falsify any other company documents. Up until now, they have admitted to one accounting error amounting to US$ 50 million, practically irrelevant for a total turnover of US$ 10 billion. This does not make the failure with regard to Valeant any better, quite the contrary. An analysis of the GAAP figures would have revealed the true condition of the company to anybody with a reasonable amount of financial expertise. The strategy of cutting the R&D budget was clearly questionable, or even self-destructive in the long run, for a pharmaceutical company depending on the development of innovative drugs. Moreover, they were jeopardizing customer satisfaction with absurd price hikes. But, clearly, neither financial journalists, analysts nor renowned fund managers showed any real interest in these developments. They wanted to hear inflated reports of success and they got them. Other than that, they turned a blind eye. The American broker Fred Schwed Jr published one of the classics of investment literature “Where are the Customers’ Yachts” 75 years ago. It is a profound yet humorous description of the abysses of the equities business. When you read the book today, you realise how alarmingly little has changed since. With regard to the Valeant case, it explains the complete ignorance of experts and their resistance to critical thinking. Because Schwed identified a strong occupational inclination to self-deception among investors. He determined that, although people talk rubbish on the stock exchange, brokers only very rarely deliberately lie. As a rule, they are actually completely convinced that they are doing the right thing, even when it is clearly nonsense. The reason for this, says Schwed, is that in their search for the key to success many speculators very often chase illusions. And they tend to be completely convinced by these illusions, brushing aside anything that muddies their vision. The statements made, for example, by experienced and successful investor Bill Ackman praising Valeant’s business policy to the skies only a couple of weeks ago perfectly illustrate Schwed’s thesis. The meteoric rise and foreseeable fall of the stock exchange star Valeant is not the first example (and will not be the last either) of a company with an unsustainable business models being hyped up on the stock market – until one day the truth is revealed and the house of cards collapses. It shows, however, that these days it really is not so difficult for independently thinking investors to avoid being deceived. In the case of Valeant, all they had to do was to take a look at the GAAP figures in the company’s financial statement.